Titles and names are very powerful. It spells out who a person is and what he stands for. When Spanish rule was no longer tolerable for the native inhabitants, the terms Filipino and indio took on a very powerful, almost spiritual, meaning for those who fought against the Spaniards. The term indio, especially, which the Spaniards used to classify those who were of indigenous origin, became the preferred brand of the revolutionaries. The children born in the United States after 1783 were the first Americans, in the sense that they were the first children born after the signing of the Treaty of Paris in which Great Britain agreed to recognize the sovereignty of the United States and formally ended the US Revolution. In the Philippines, the first Filipinos of a sovereign nation are those born in the Philippines after July 4, 1946 when we were finally granted our independence by the United States. 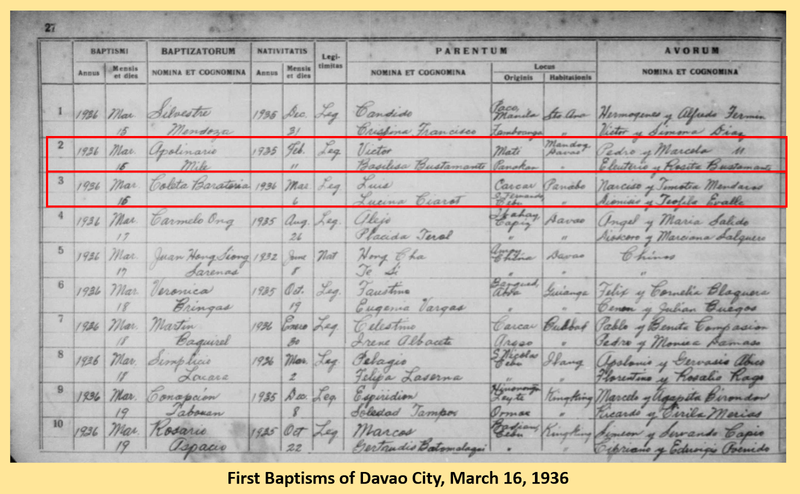 Today, in this fourth installment in the Davao Genealogy series, we take a look at 2 individuals in the history of Davao who have the distinction of being the first to be born right after the municipality of Davao became the City of Davao on March 16, 1936. Three babies vie for the title of being the "first Dabawenyo" after the town was granted the status of cityhood. 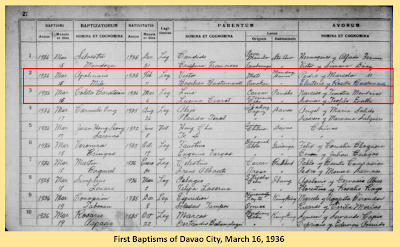 The first is Apolinario Mile, while born on February 11, 1935, was baptized on the very day that Davao became a city. Apolinario was the son of Victor Mile, from Mati, and Basilisa Bustamante, from Panacan. On the same day that Apolinario Mile was baptized, Coleta Barateria was also being welcomed into the Christian world. Coleta was born on March 6, 1936, the daughter of Luis Barateria from Carcar, Cebu, and Lucina Ciarot, from San Fernando, Cebu. 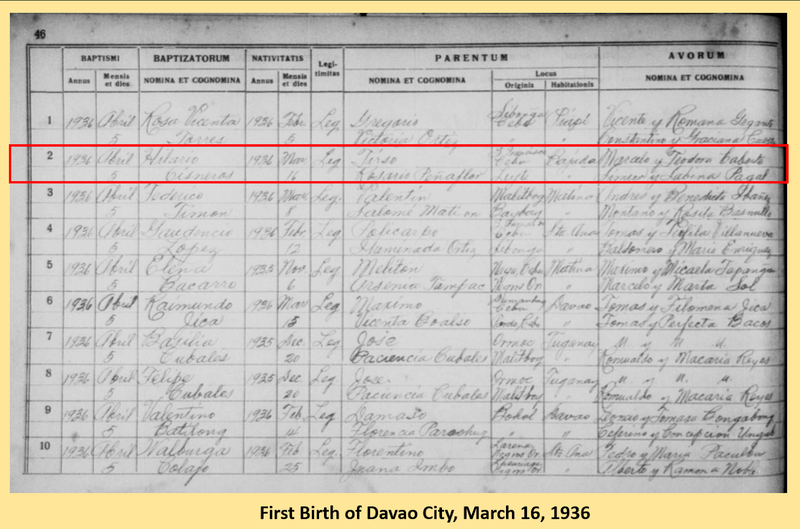 Of course, nothing beats the special child that was first to be born in Davao on the day it became a city: Hilario Cisneros. Born on March 16, 1936 and baptized April 5 of the same year. He was the son of Tirso Cisneros of San Francisco, Cebu and Rosario Penaflor of Leyte. 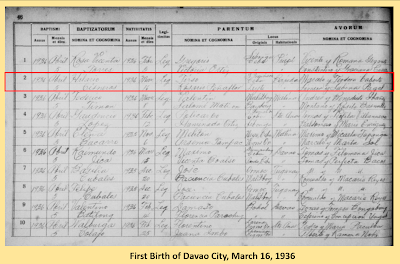 While he may not be the only one born on the day Davao became a city, he is the first one to appear on official records as being the first child of Davao City.